Punta Cana, Dominican Republic locates along the tip of the Atlantic and the Caribbean Ocean. The region is most famous for its beautiful beaches and pristine blue waters, which stretch for as many as 32 km! The Dominican Republic is also known for its beautiful colonial architecture, the amazing mangroves and cliffs as well as the exotic palm-lined white sand beaches. The Club Med Punta Cana is situated right on the resort town and is a perfect getaway for families and couples alike who’d like to explore the stunning turquoise beach, which stretches for half a mile. The resort is located about 200 km away from Santo Domingo, the capital of the Dominican Republic. The Club Med resort offers a variety of accommodation options to choose from- there are 553 rooms available in the Punta Cana resort; these are located inside enchanting 3-storey pastel-colored structures. Most accommodations are located in different sections of the resort amidst lush green gardens. There are 4 different room categories based on the amenities and spatial dimensions: Club, Deluxe, Suites 5 Trident Space, and the Zen Deluxe rooms. My favorite is definitely the Deluxe Zen rooms, which are located in the ‘Zen Oasis’ area of the resort, and have been recently renovated. Besides the exclusivity and the incredibly large swimming pool in the center of the village, each room has its own garden space or spacious rooftop terrance. The Punta Cana resort boasts the Club Med Spa, which offers a variety of treatments to reinvigorate your being. There’s even a Couple VIP Private Spa and a Men’s Lodge by L’OCCITANE. A rejuvenating spa experience in a private VIP space with stunning views of the Carribean sea is highly recommended, as is a body massage under the traditional Palapa! Jet Bath, Body Scrub, Body Massage, Facial, and a variety of other exclusive treatments are all available on demand. What I liked most about the spa experience is that it is theme-based: you can choose from the ‘Relax’, ‘Revitalize’ and ‘Sport Recovery’ themes. The Zen Oasis is an exclusive adults-only area inside the resort, which houses a large lagoon pool, a beautiful sundeck, and a Jacuzzi. ‘Hibiscus’ is a charming poolside bar located in the Zen Oasis. There’s even an isolated white sand beach in this part of the resort, complete with lounges and enclosures to offer respite from the sun. The Tiara Luxury Space too deserves special mention. There are 32 family suites situated right on the beach edge along with a beautiful seafront Infinity Pool. Punta Cana is also considered one of the world’s best golf destinations owing to the presence of 5 high-quality golf courses, which are counted amongst the top 50 worldwide and the finest in Latin America and the Carribean. These are situated a short distance away from the resort. Kids can enjoy the mini-golf games too! The place also holds the distinction of housing the world’s largest sports school, with a variety of activities on offer. You can learn at the Archery School, Fitness School, Golf School, Tennis School, Sailing School, etc to name just a few. Scuba Diving, Deep Sea Fishing, Wakesurfing, Tubing, and Kitesurfing are amongst the top activities guests opt for while in the resort. Finally, CREACTIVE by Cirque du Soleil is a creative circus-inspired playground, which features acrobatic sports and artistic activities for people of all ages. 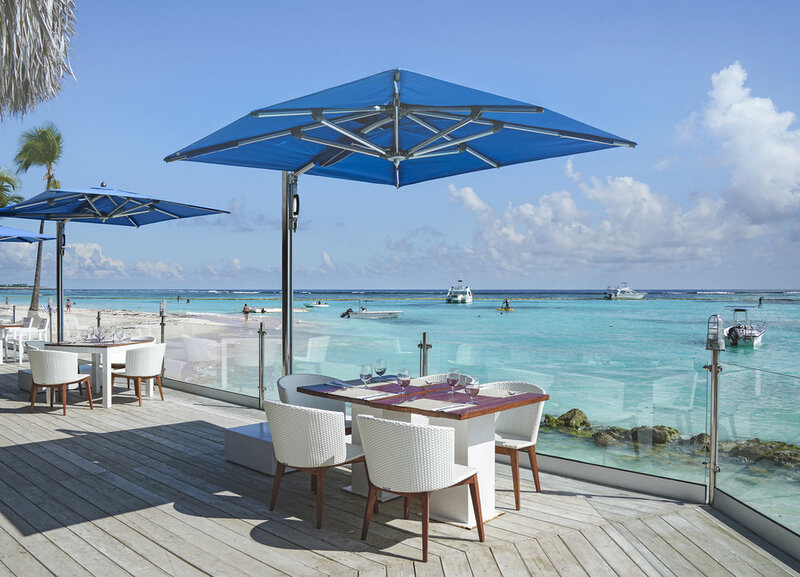 The Club Med Punta Cana houses 3 restaurants that offer a gourmet food experience for the most discerning guests. You can enjoy an all-day dining experience from breakfast through dinner. Samana: Situated near the lagoon pool and the main bar, a newly renovated restaurant, which has been completely redecorated, offers international buffet all day. Hispaniola: This is a beautiful restaurant situated by the water’s edge. Do not miss the panoramic views from the restaurant terrace! Hispaniola, also recently renovated, is a great place to relish international cuisine to satiate your palate. A grill is organized for lunch while a theme-based buffet is prepared for dinner every day. Indigo: this is a charming beach lounge, which has had a unique makeover and is situated by the waterside. Comprising a restaurant, bar, and a lounge, this is a great place to indulge in the flavors of the region’s local specialties in an amazing ambiance. You can even opt for a takeaway meal should you wish to enjoy a feast on the beach itself! What’s more, the approaching night sees Indigo transformed into a Nightclub. Dancing under the stars is a memorable experience of a lifetime indeed. Apart from the 3 restaurants, the resort is also home to the amazing bars, namely: Cielo, Hibiscus, La Cave, and of course the Indigo Beach Lounge.